Dr. Sherwin Nuland, author of the National Book Award-winning How We Die, once again combines knowledge, compassion, and elegance of expression to shed light on the workings of our bodies from the perspective of a surgeon. 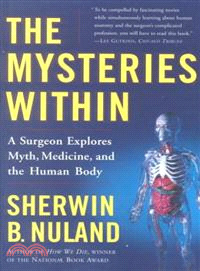 Dr. Nuland recounts age-old legends about the functions and "personalities" of the body's organs and, in riveting vignettes of the surgery he has performed, he describes the connections between myth and reality. A brilliant blend of science and folklore, The Mysteries Within reveals the enigmas not only of the body but also of the human imagination. Sherwin B. Nuland, M.D., F.A.C.S., is clinical professor of surgery at Yale School of Medicine, where he has taught since 1962. How We Die was a finalist for the Pulitzer Prize and the National Book Critics Circle Award. His most recent book is The Wisdom of the Body, published in paperback as How We Live.